Although as a child I watched just about every piece of animation that you could imagine, my interest in it creatively didn't really occur to me until much later. I was always artistic and very interested in drawing and the process of animation, but it all seemed very elusive at the time. I was at least 16 before it really dawned on me. At college I studied interactive media and film, planning to become a concept artist or storyboard artist. In the end though it really served to catalyse my love of animation, which I took as my specialisation in my second year. I love drawing and seeing your own character come to life on screen — that alone is worth all the time it takes drawing the frames. I didn't know much about the process so it was a huge learning curve. The course was really good at helping me get to grips with how to direct animated films, create my own independent projects or business. The tutors are excellent at helping you work through story development and really question WHY you are making something. They help you establish your own style and voice and encourage you to think in abstract and less conventional ways. 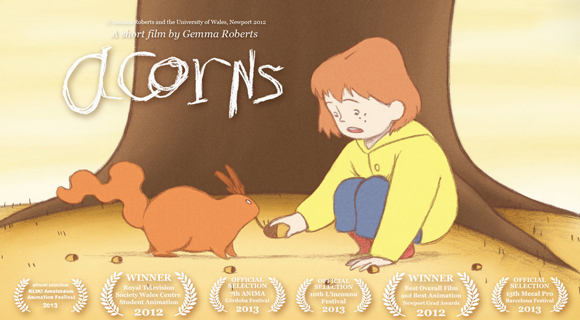 Before finishing my course, I was working flat out on my final film, Acorns. I only just got it finished even after a slight extension to finishing colouring and compositing for our grad show. I put everything into it, and I think I've got a lot back out of it. I wasn't specifically trying to get a job — I was just trying to make a good film that I could be proud of. I think a project that really shows your passion for something goes a long way, so if you're looking for an artistic career, you should put your best efforts into everything you do. My film won Best Animation as well as Best Film at my University's graduation show, which was also attended by one of the Production Coordinators from Lupus Films (also a previous Newport graduate). Gemma received work after attending a graduate talent aggregator event, part of the Creative Skillset on Course scheme. UKCES invested £516,535 in this scheme through the Growth and Innovation Fund, alongside £240,000 co-investment from Creative Skillset. The scheme aims to develop a quality assurance framework to ensure the most industry relevant qualifications are clearly signposted and to provide employers with the tools to identify high quality job applicants. For more information about the scheme, please visit the Creative Skillset website.